The University of Scranton presented plans for the largest capital project in its 121-year history – an approximately 200,000 square foot unified science center - at a groundbreaking ceremony on campus this morning. The facility incorporates today’s most innovative science teaching techniques into a dynamic, modern design that includes inviting spaces for student/faculty collaboration, visible glass-walled laboratories and the efficiencies of using shared instrumentation. Designed for silver Leadership in Energy and Environmental Design (LEED) certification, the center includes an approximately 150,000-square-foot, four-story new structure on what is now a parking lot along Monroe Avenue and Ridge Row. The new building will be seamlessly integrated into nearly 50,000 square feet of renovated space in the Harper McGinnis Wing of St. Thomas Hall. The design includes a new entrance into St. Thomas Hall and the science center from the Commons. “The new science center matches the unparalleled excellence of the science programs for which The University of Scranton is so well known and will serve all our students through the engaging and innovative pedagogies fostered by this design,” said Rev. Scott R. Pilarz, S.J., president of The University of Scranton. 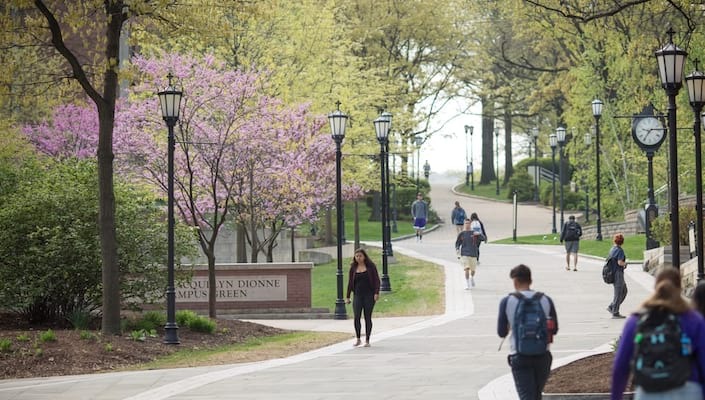 As part of Scranton’s Jesuit liberal arts curriculum, all undergraduate students are required to take at least two natural science courses. The unified science center will provide the university’s departments of biology, chemistry, computing sciences, physics/electrical engineering and mathematics with classroom, office, laboratory and meeting spaces. This building will also serve several interdisciplinary programs, including neuroscience and biochemistry, cell and molecular biology. Joseph Dreisbach, Ph.D., interim associate provost for academic affairs, said the design builds on the concept of the Project Kaleidoscope organization, which is a National Science Foundation initiative intended to enhance the quality and effectiveness of teaching and learning in the sciences. According to Dreisbach, the center is designed to maintain Scranton’s tradition of a teaching/learning community, while allowing for faculty and students to organize by function, program or research affiliation. By using spaces for shared instrumentation and resources, the design optimizes space for faculty/student research. The building also includes student/faculty meeting spaces and a variety of classroom types. The University of Scranton expects the new building to further enhance its already stellar reputation for preparing students for careers in medicine, health care and the sciences. Of the 353 senior applicants to medical schools over the last nine years, an average of 81 percent were accepted, well above the national average. According to the 2008 NSF Survey on Earned Doctorates, in 2006 (the most recent year reported), Scranton ranked 9th out of 568 master’s institutions that reported data for alumni who earned doctoral degrees in life sciences, and 37th of 568 in the physical sciences. “The glass-walled laboratories along main corridors of the center will highlight the activity of scientific research and show students and faculty engaged in shared research,” said Harold Baillie, Ph.D., provost and vice president for academic affairs. Currently, more than 50 percent of the university’s students in sciences, engineering, technology and mathematics already participate in research. Forty-five percent of these students wrote a formal thesis, and 38 percent authored or coauthored a publication and/or conference papers. The unified science center is among the transformational building projects of the University’s $100 million capital campaign. “I am also grateful to our benefactors who have already made significant and special commitments to science education at the University. Our efforts to raise funds for this project will continue,” said Fr. Pilarz. In addition to 22 class and seminar rooms, 34 laboratories and 80 offices, the center includes a rooftop green house for research, a 180-seat lecture hall for symposia and seminars, an atrium, a vivarium, several faculty/student research and meeting areas, and a faculty meeting room modeled after the tea room at Oxford University. The center was designed by EYP, Einhorn Yaffee Prescott Architecture and Engineering, P.C., that has also designed science facilities at Franklin and Marshall and The College of the Holy Cross. The Quandel Group Inc., Scranton, is the construction manager. Pending approval from City and County planning commissions, construction is expected to begin this summer and to be open for use for the fall semester of 2011. The unified science center will replace Loyola Hall, which was built in 1956 and renovated in 1987. Currently Loyola Hall allows only enough space for the biology and chemistry departments.